What are safe nitrite and ammonia levels for fish? Both levels should always be zero, anything higher is stressful and detrimental to your fish and at higher levels ammonia and nitrite are deadly. What do I do if ammonia or nitrite levels are high? 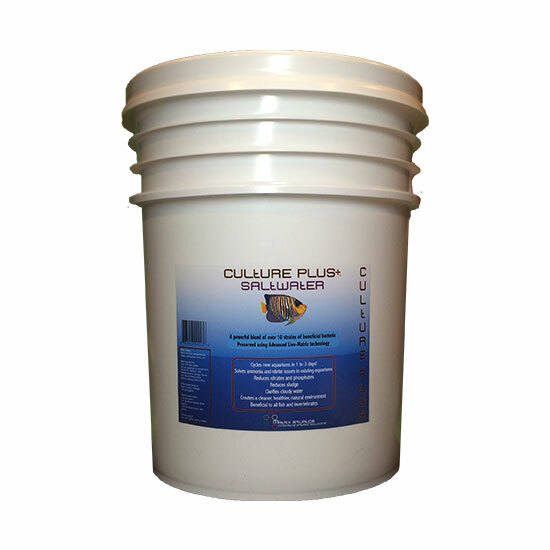 Add Culture Plus and/or Culture Max to boost the developing bacteria culture. Check your Ph, temperature, salinity (for saltwater aquariums) and dissolved oxygen to make sure they are in the correct range, all nitrifying bacteria function best when these parameters are correct. Remove filter socks and leave them out for a week, turn off your protein skimmer (saltwater), your UV and ozone generator 48 hours prior to adding Culture Plus to avoid killing the bacteria and leave them off until the aquarium is fully cycled. If your ammonia is above 3ppm you will need to do a water change to lower the ammonia as all nitrifying bacteria is impeded if introduced into a tank with high ammonia levels. 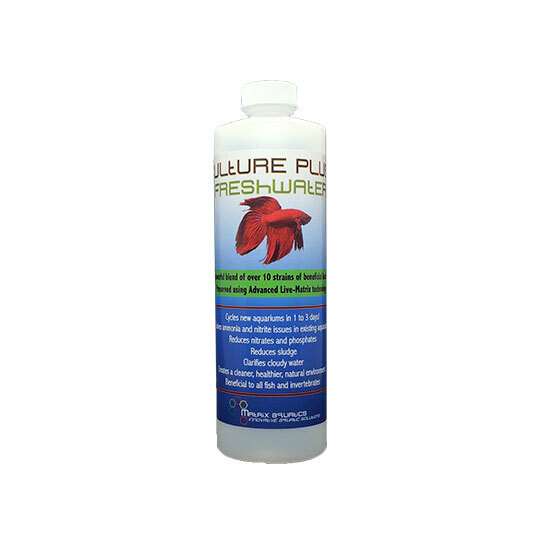 Check your phosphate levels and make sure you have some phosphate present in your aquarium in order for the bacteria to be able to convert nitrite to nitrate, all nitrite “digesting” bacteria need some phosphate in order to function. 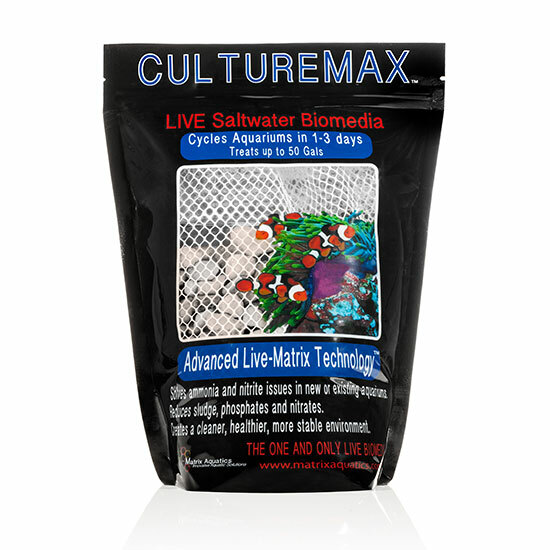 Check your alkalinity (saltwater) and add an alkalinity buffer if your alkalinity is low. All nitrite “digesting” bacteria’s ability to convert nitrite to nitrate is impeded when the alkalinity is low. If your nitrite level is above 3ppm you will need to do a water change to lower it, as all nitrifying bacteria is impeded if introduced into a tank with high nitrite levels. Do a water change to lower the ammonia and or nitrite and vacuum the gravel to remove any uneaten food and excess debris. Look for dead fish and remove them. If you used medications, do a large water change and add new carbon to your filter to remove any residual medication. Check your Ph, temperature, salinity (for saltwater aquariums) and dissolved oxygen to make sure they are in the correct range. Check your phosphate levels and make sure you have some phosphate present in your aquarium in order for the bacteria to be able to convert nitrite to nitrate (probably not the case in an existing aquarium). Remove filter socks and leave them out for a week, turn off your protein skimmer (saltwater), your UV and ozone generator 48 hours prior to adding Culture Plus and for 7 days following the addition of Culture plus to avoid killing the bacteria. How do I know if Culture Plus or Culture Max is working? If your test shows some ammonia and or nitrite in the water it does not mean the product is not working. As long as you followed the directions precisely and your water parameters are where they need to be, the product will work. 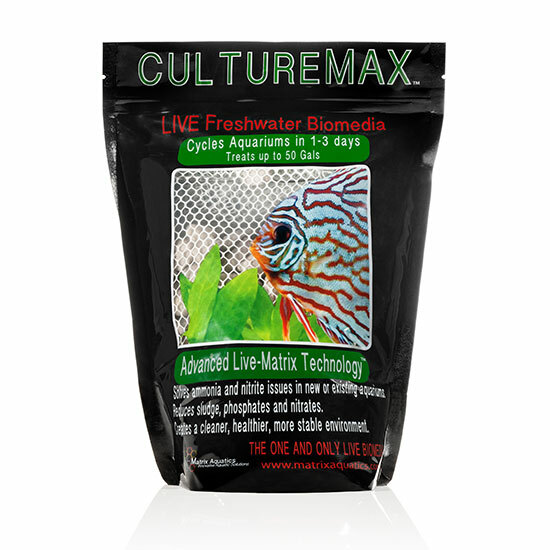 How fast an aquarium cycles with Culture Plus or Culture Max depends on many factors, such as the amount of ammonia being produced, the number of fish and size, the filter turnover, how much bio media is in your filter etc. etc. In order to determine if the product is working, test your ammonia, nitrite, and nitrate. If you show ammonia but also show nitrite it means the ammonia “digesting” bacteria is converting the ammonia to nitrite, and if you also show nitrate it means the nitrite “digesting” bacteria is also working and converting the nitrite to nitrate. Give the tank more time and make sure your PH, temperature, salinity (saltwater), alkalinity (saltwater), and dissolved oxygen level are all in the correct range. 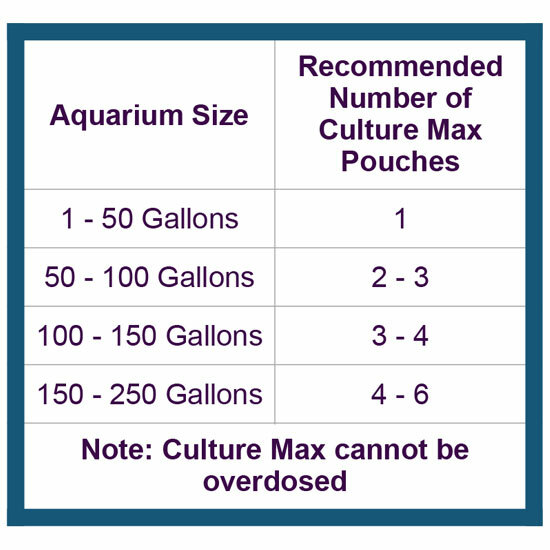 How many Culture Max pouches do I need? Need to ask something not answered above? Use the form below and we’ll answer your question shortly.